When did you hear that you were chosen as the Pantone Color of the Year? We don’t know until the public knows. I knew I was a finalist because execs at Pantone had been staring at my swatches, but I tried not to think about it until the announcement was made. According to my agent. I had to be told twice, so yeah, I was surprised. At first I thought I was the Pantone color of the day, which is also a considerable honor. Pantone calls you a “multifaceted hue reflecting the complexity of the world that surrounds us.” What does it feel like to hear comments like this? I’m not allowed to blush because that would change my color, but if I was allowed I probably would. Do you see the world as particularly complex? I see the world as complex, but I also see this complexity as a result of how light manipulates cone cells in the retina. The world is a billion different things, yes, but if I ever get overwhelmed I just stop and think about how everything is just a variation of red, green, and blue. Pantone says that emotionally you are “anchoring and meditative with a touch of magic.” Is this a fair representation of how you see yourself? I can see how I may be perceived this way, but some of the colors I’ve dated might feel otherwise. I’m sorry I brought that up. I’d rather keep my personal life private. While the overall "color of the year" for the North American International Auto Show in Detroit may be "green", and for good reason, there are a few new colors, and the comeback of a few classic colors as well, that will soon be seen at your local parking lot or drive-thru line. The auto industry is known for sticking to standard hues from year to year - which is still a big step compared to Mr.Fords 'one color for all' Model T, and his motto: “Any customer can have a car painted any color that he wants so long as it is black,” and while the general colors remain the same, it is the shades that are continually becoming more and more interesting every year. 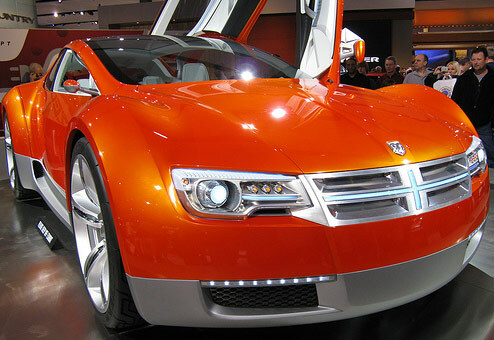 Recently, the colors used on automobiles have been made up of multiple color layers added together with translucent layers making each color increasingly more complex. Look at a car from one angle the color might be "scorched penny" but as you move your point of view around the car the color moves along with you changing drastically from that bright orange to nearly black. After seven years in first place, silver ran into tough competition this year with white/white pearl rising to the lead color choice for vehicles in one key region and two countries. In North America, white/white pearl, silver and black/black effect are in a virtual tie for first, with white/white pearl narrowly taking the top spot, according to the report issued by the company’s Automotive Systems business. White overcame silver in Japan and is the decisive leader in Mexico, more than doubling the popularity of gray. So, while the car industry never strays too far from the popular colors, the growing 'niche' color market is something for a color lover to excited about. In recent years the niche market has seen bright saturated oranges and greens. Imagine what might come next, I'm hoping for patterns, but we will just have to wait and see. Widgets, Widgets everywhere! One of the coolest recent web trends has been the development of widget platforms that allow people to easily create and share tools to help communicate and connect any number of their interests or ideas. It is much more simple for individuals with good ideas and a bit of gumption to develop tools that thousands if not hundreds of thousands of people will enjoy using. The idea is often the easiest part, the execution of it is the challenge... So we hope by using our resources you'll be able to share your widgets with the world in any number of colors and color combinations. Widgets are great because with little effort you can add music, a timer to your baby's birth or a clock for keeping time on your site... but if the widget's color options are locked in place, it makes it less appealing to the public when they can't find a color option that fits in well with the colors of their site or matches their personal style. MyFlashFetish has tons of flash widgets that you can add yto your websites, blogs or profiles... Clocks, Countdown Timers, Days You've Been in Love and two dozen or so styles of mp3 players. And with almost all of these widgets they allow you to customize the colors to match your style. MyFlashFetish has uploaded dozens of color options for their widgets, but even if you can't find the perfect colors... you can load in your latest palettes from the COLOURlovers.com site. 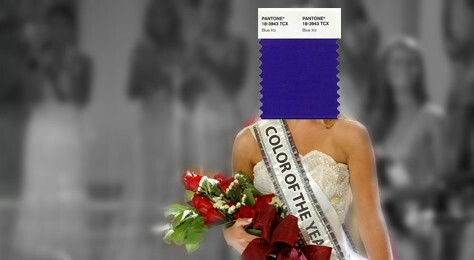 According to color supplier Pantone®, the color of 2008 is Blue Iris. The blue is a radiant, calming hue, dark, but not dark enough to be in the realm of navy, and is a sharp contrast to the 2007 choice, Chili Pepper Red. "From a color forecasting perspective, we have chosen PANTONE 18-3943 Blue Iris as the color of the year, as it best represents color direction in 2008 for fashion, cosmetics and home products," explains Leatrice Eiseman, executive director of the Pantone Color Institute®. "As a reflection of the times, Blue Iris brings together the dependable aspect of blue, underscored by a strong, soul-searching purple cast." Pantone has chosen some form of blue for Color of the Year in 2000, 2003, and 2005. Now, Blue Iris is it in 2008. Other professionals disagree with Pantone’s choice. 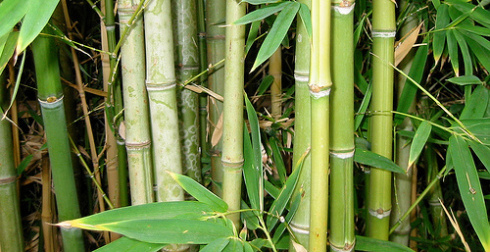 Margaret Walsh, director of the Color Association, says her color of 2008 is bamboo. She believes the strong green, hinted with yellow, represents the changing social desire to be more environmentally clean. I'm sure most color lovers have seen the memorable Sony Bravia Advert where paint cannons were used to brilliantly color an apartment complex. Well, now they're back with a new commercial using a combination of stop motion, radiant colors, and claymation. Going to the site begins with tag lines about the effects colors in our lives, one of which is the use of red, orange, and yellow to entices appetite and how the use of pink in bubble gum when it was first invented -- which later became the standard -- was only pink because it was the only color the creator of bubble gum had. Joining up with Hasbro, the company that owns and distributes Play-Doh, this new commercial with the slogan 'Colour Like No Other' for their LCD line hops to life in New York City. Play-Doh was invented by Noah and Joseph McVicker in 1956 and awarded U.S. Patent 3,167,440 in 1965. One of many common products invented by accident, it was meant as a wallpaper cleaner. It was marketed by toy manufacturer Rainbow Crafts, and first sold at the Woodward & Lothrop department store in Washington, D.C. Seen here is its 50th Anniversary Collection, showcasing fifty of the colors available today. 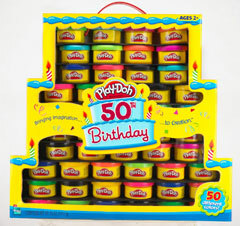 Play-Doh is available in several different colors from day-glo to primary and sizes, and has a distinctive smell and texture. Over 900 million pounds have been sold so far. The product is now owned by American toy giant Hasbro. I've always been fascinated with the cover font color choices magazine editors make. We've begun to index those choices in our Magazine Color Trends section, but we thought we would look at some of the most iconic covers in history. In 2005, the 40 greatest magazine covers of the last 40 years were unveiled at the 2005 American Magazine Conference (AMC) in Puerto Rico, by the American Society of Magazine Editors (ASME) and AMC. Looking at the top 20 has shed some light on some of the most interesting color choices in the industry. 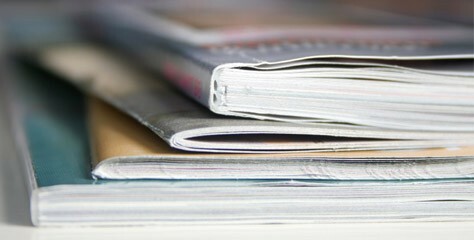 Starting with number twenty, we'll take a trip back through the world of publication color. A man diving appears on the premiere October 1997 issue of Blue. Art Director David Carson, known for his innovative typography and photography designed the cover. Editor Amy Schrier launched the first adventure lifestyle magazine, covering outdoor recreation, action sport and adventure travel for men and women. The magazine also explored the diverse cultures of the world and took a look at their political, economic and social concerns. And the Emmy Award Goes to… Color! I personally thought Marica Cross looked amazing. The turquoise accent color she wore in her earrings and bracelet really worked well with the rest of her natural palette. Her red hair looked gorgeous with her skin tone and the light colored dress worked well to let the natural elements shine. No spray tans or glitzy jewels needed here... just a beautiful woman well accented by light and natural colors. TEXTTILE ARTS has the finest in retro, mid-century modern and contemporary Scandinavian design from MARIMEKKO and for the first time in the US, LJUNGBERGS. From fabric and wall hanging kits to umbrellas and handbags, if you want colorful modern design you have come to the right place. Are they now making an effort to dominate the rest of the "older" market? Music can be a very youthful industry. In most Mass-Market Genres: Pop, Rap, R&B, Etc. the most popular artists usually have a expiration date around 30 years old. Apple has done a great job tapping the young and creative crowd to create a very loyal and early adopting fan base. The buying power of these young early adopters has fueled amazing growth of the digital music industry and with an already great market share, it looks like Apple is using some more mass-appealing colors to reach out to the rest of the market.